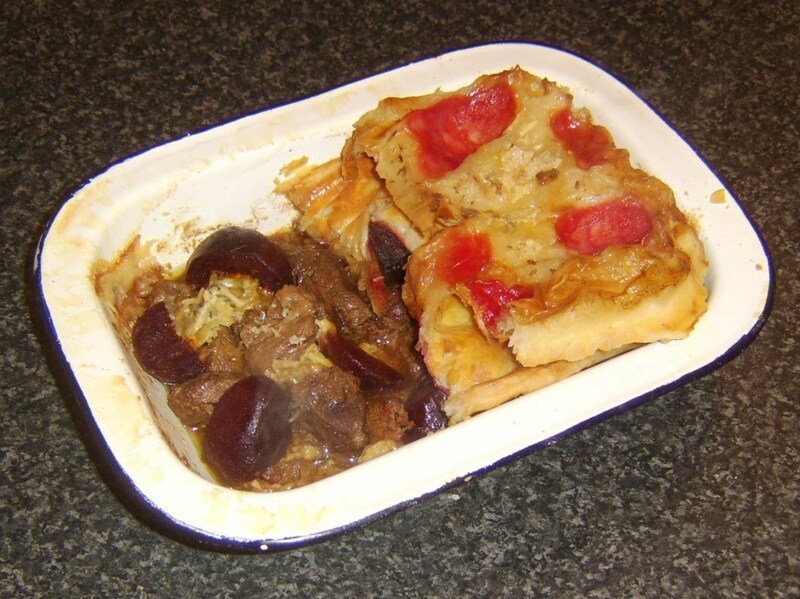 Steak pie in a more conventional sense is one of the most popular meat dishes prepared and eaten in Scotland. 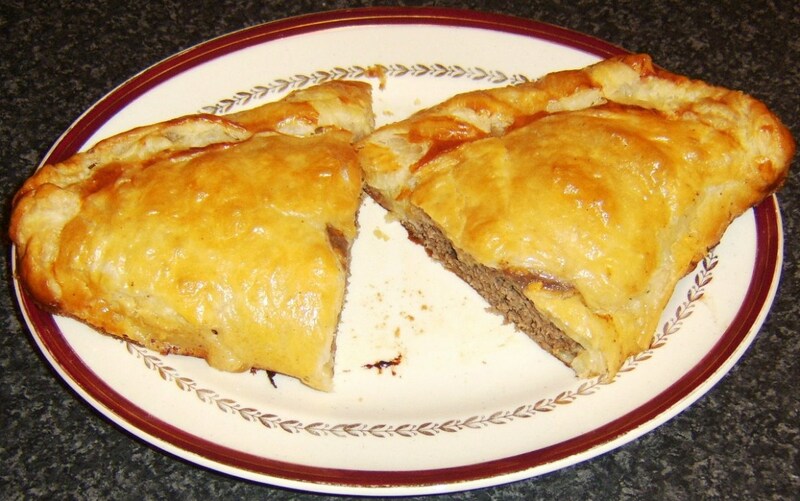 It is traditionally made from beef steak and sausages in a rich gravy and topped with puff pastry. Steak pie of this type could perhaps be deemed to be one of the truths about what Scots eat on a regular if not exactly day to day basis, scorching the myths about compulsive and obsessive haggis consumption. 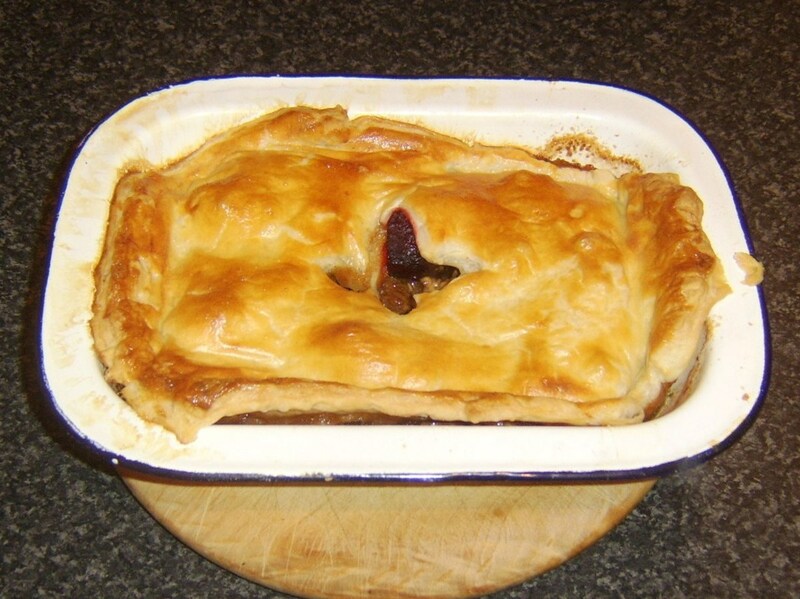 While that conventional pie is clearly the inspiration here, this steak pie is very different and eliminates the sausages altogether in favour of the sweetness of beetroot and the rich, distinctive flavour of the King of English cheeses, Stilton. 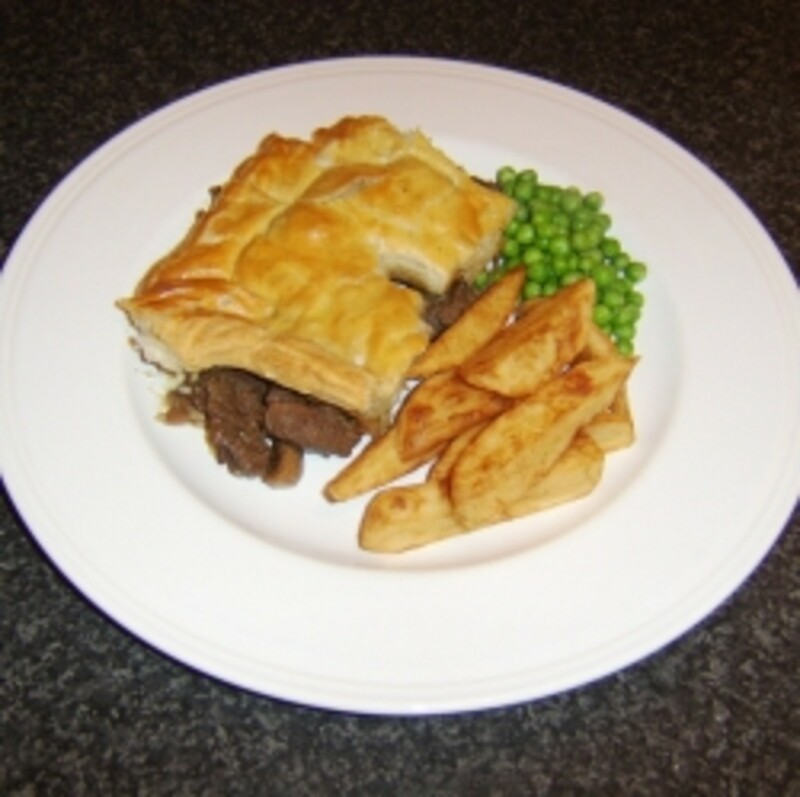 Like this Steak Pie Recipe? Please Star Rate it Below! 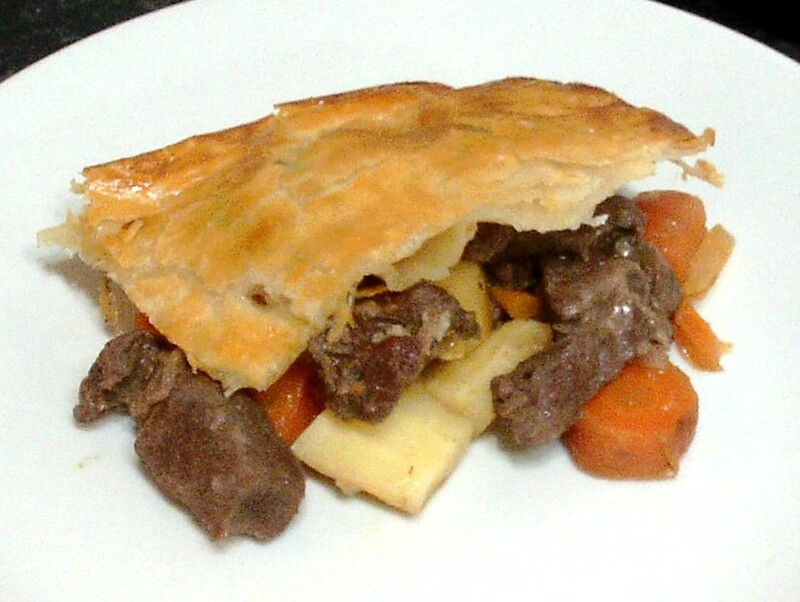 Shin of beef is far from being the most popular choice when preparing a steak pie. 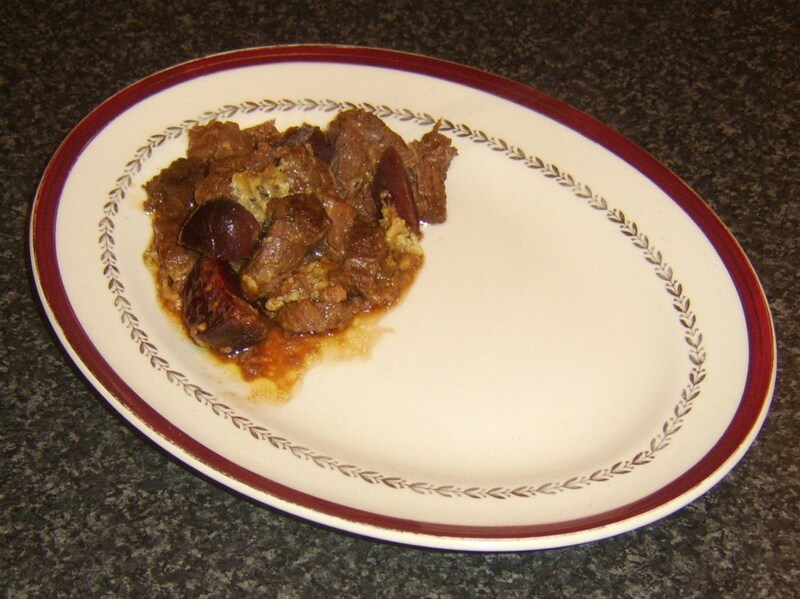 It is often seen as being tough and consequently unappetising but when it is cooked properly, long and slow, it is at least every bit as delicious as the finest stewing steak or beef. The fact that it is also considerably less expensive could and should provide all the extra motivation required. 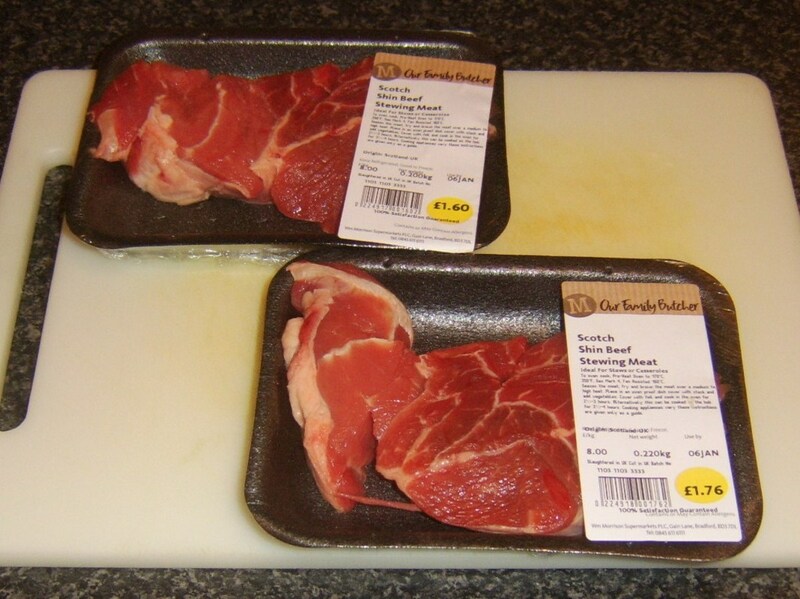 It may be that you buy your beef or steak ready diced. 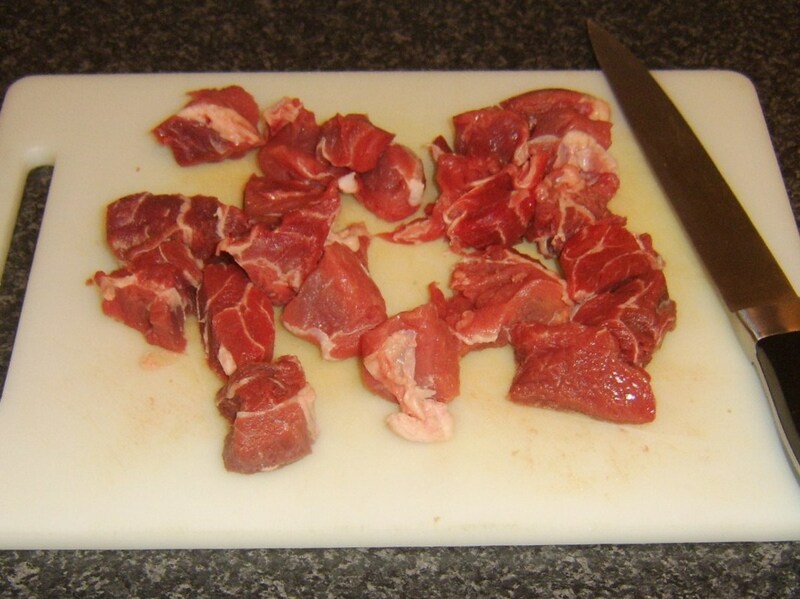 If doing it yourself, use a sharp knife on a chopping board and cut to approximately one inch pieces. 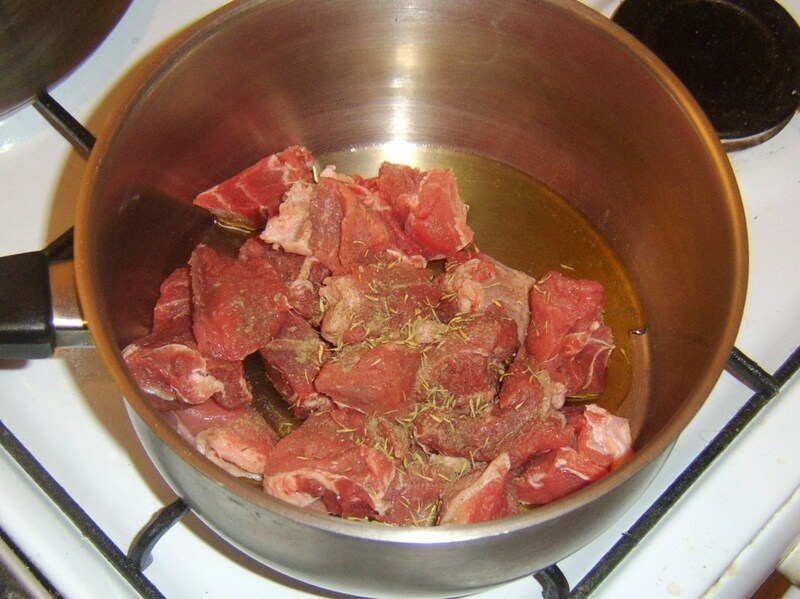 Do not cut off the fat - this represents flavour and will render down during the cooking process rather than remain attached to the served meat. Pour a tablespoon or so of olive oil in to a large pot. Add the beef and season with salt, pepper and the dried thyme. 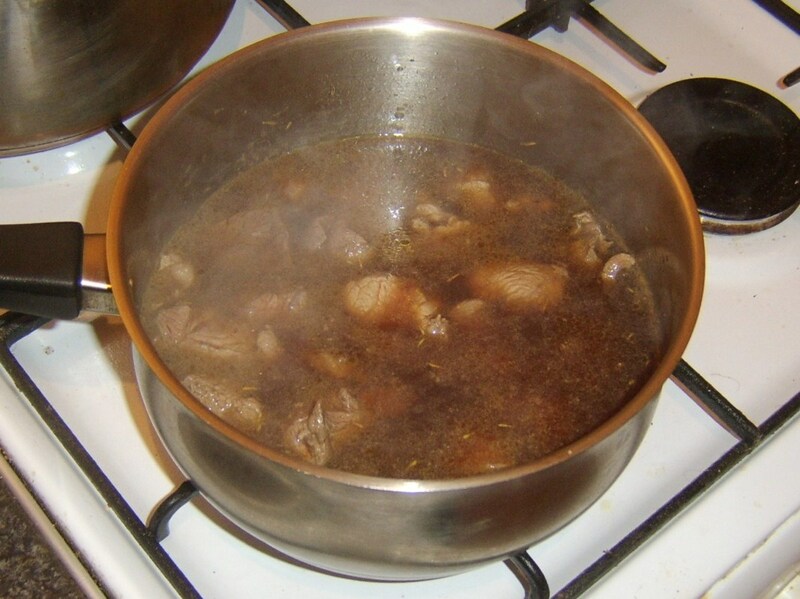 Brown and seal the meat over a medium heat, stirring all the time with a wooden spoon. Pour the beef stock in to the pot and bring to as gentle a simmer as possible for two to two and a half hours, until the beef is very tender. Stir occasionally and monitor the liquid level. If absolutely necessary, a little bit of boiling water can be added as required. Switch off the heat, cover the pot and leave for at least an hour to cool. 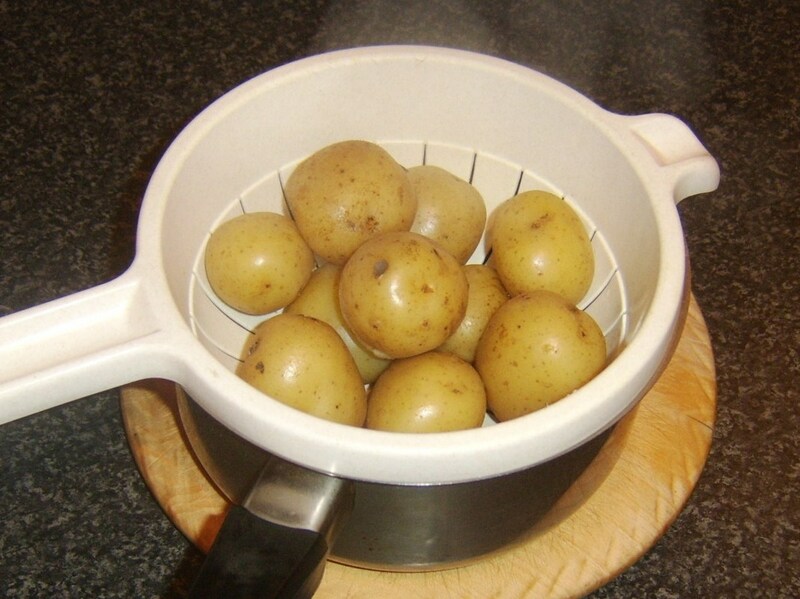 Wash the potatoes well in cold water - scrubbing if necessary - and put them in to a pot of cold water. Season with salt and bring the water to a boil. Reduce the heat and simmer for around twenty minutes or until the potatoes are just soft. Drain well and return them to the empty pot to cool completely. Start your oven preheating to 210C/425F/Gas Mark 7. This pie dish is what is called an ashet and measures ten inches by seven inches. It is around an inch deep. You will need a dish of similar capacity. Use a slotted spoon to lift the beef or steak from the gravy and spread evenly on the bottom of the dish. 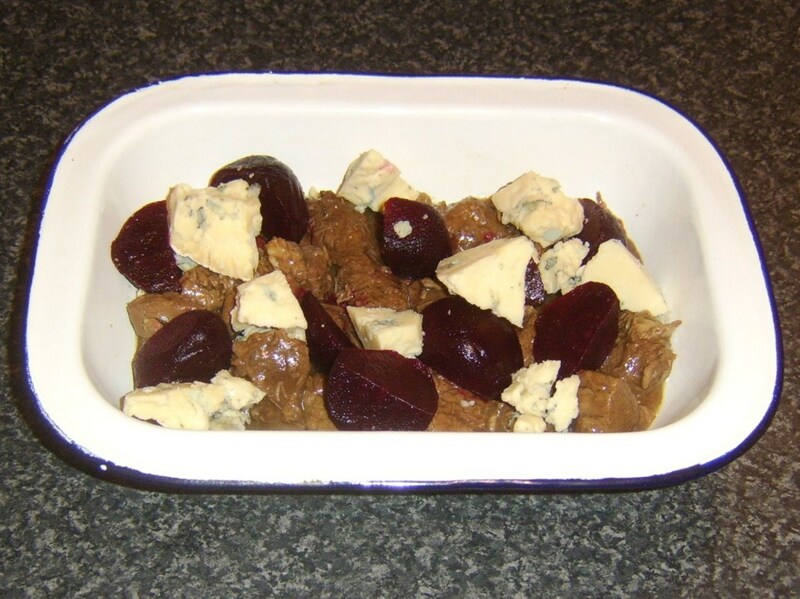 Add the chopped beetroot and Stilton as shown. Carefully pour over a little of the cold gravy to approximately half cover the solids. 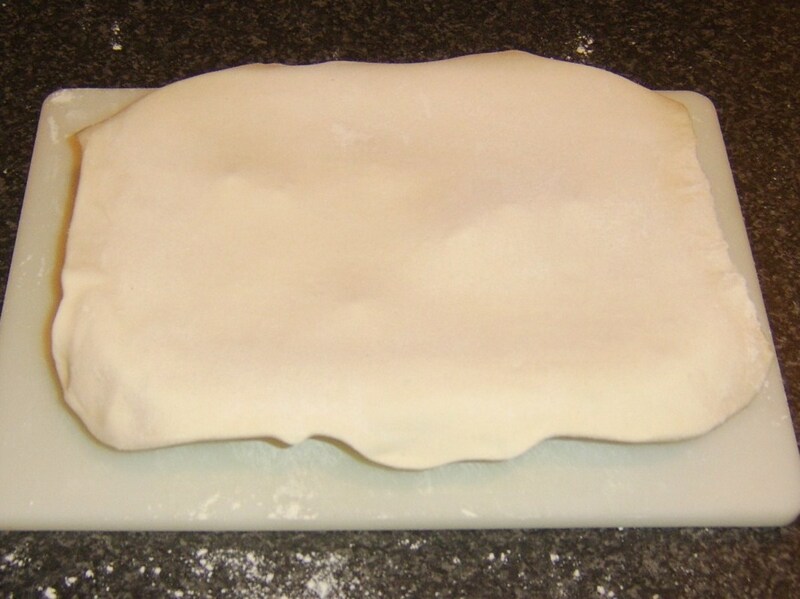 Roll out the pastry on a clean, dry, flour-dusted surface to a rectangle slightly larger than your pie dish. Lift the rolled pastry on top of the dish and carefully trim around the edges with slashing movements of a large, sharp knife. Crimp the pastry around the edges with your thumb and forefinger. This helps stop it shrinking too much. Glaze the pastry all over with beaten egg and cut a steam vent in the centre. Lift on to a roasting tray to help contain any potential spills and put it in to the oven for thirty-five to forty minutes, until the pastry is risen and golden. You will see when the pie comes out of the oven that the pastry has shrunk and some may think the pie looks less attractive than it would have had it been secured around the edges. 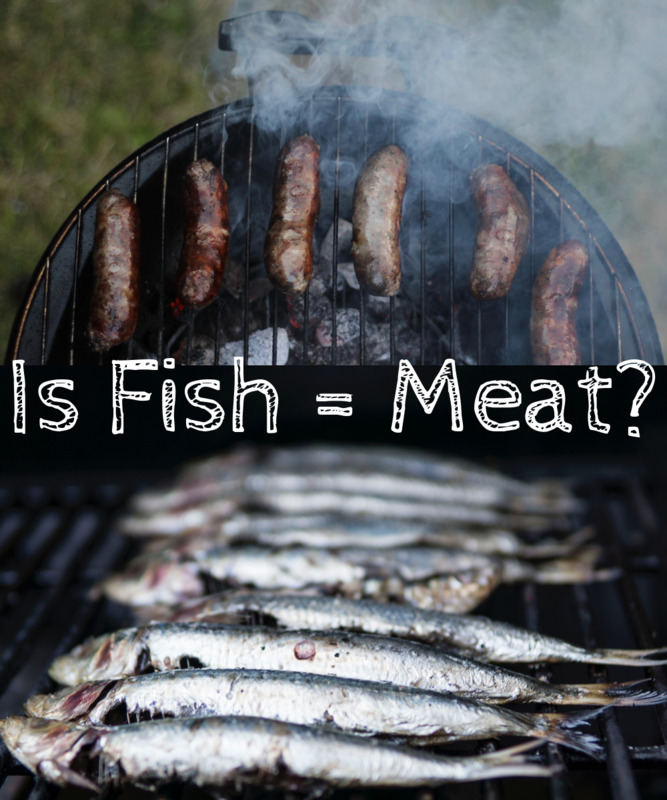 The good news is that this factor will not be noticeable on the plate, for reasons described above. 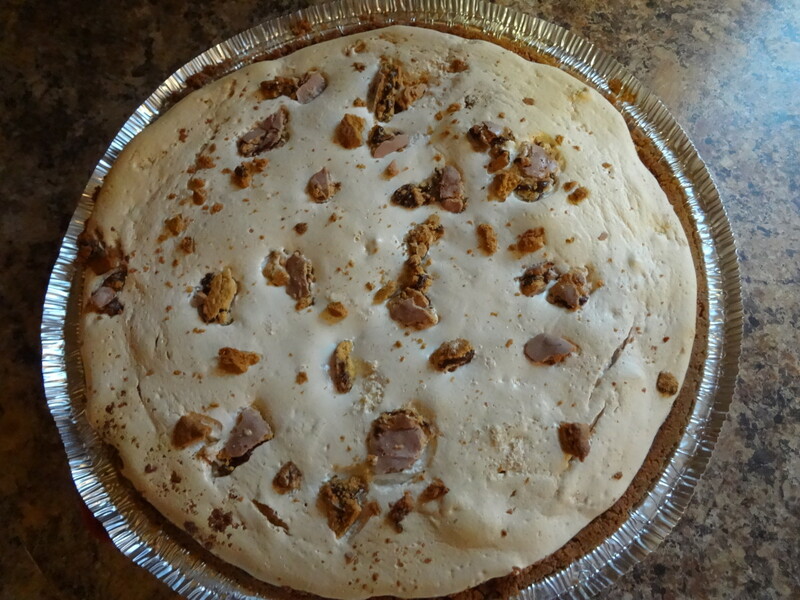 Sit the pie on a heatproof surface and leave it to rest for ten to fifteen minutes. Brief Information Interlude: Land of Pies and Pasties? 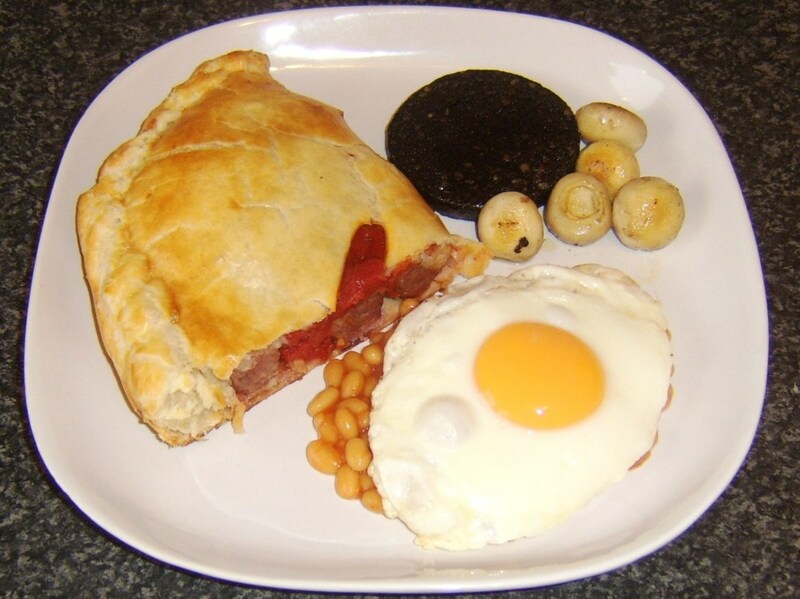 There is a widely held perception around the world that the British are a race obsessed with creating meat and fish based pies and pasties. Unlike many food generalisations applied to countries and their peoples, this is one that cannot be denied and is very much based in fact. 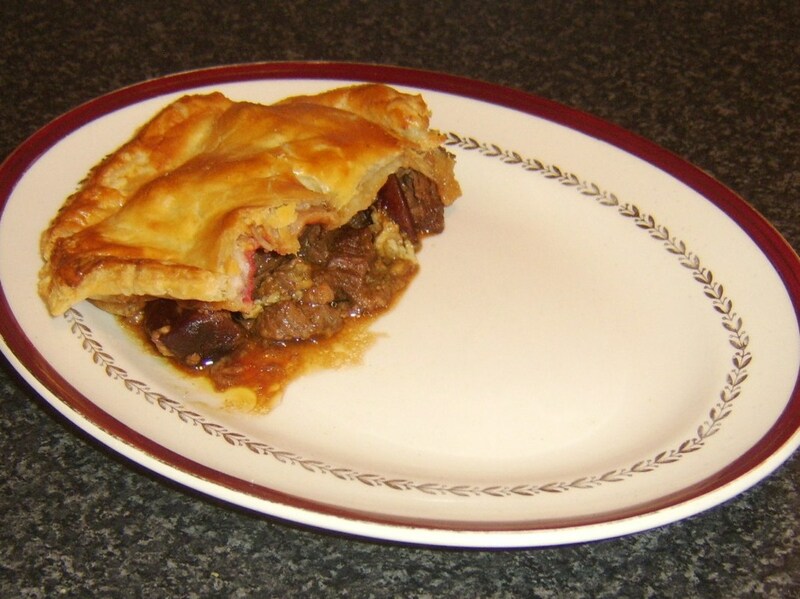 While sweet pies such as apple or blueberry pies may be most popular in the US, in the UK you are far more likely to find pies made of steak and sausage, steak and kidney, pork, or various fish combinations - although sweet pies are popular as well! What it is important to know is that many of these pies are absolutely delicious and are not accurately represented by a high percentage of cheaper end of the scale, supermarket productions/ reproductions. 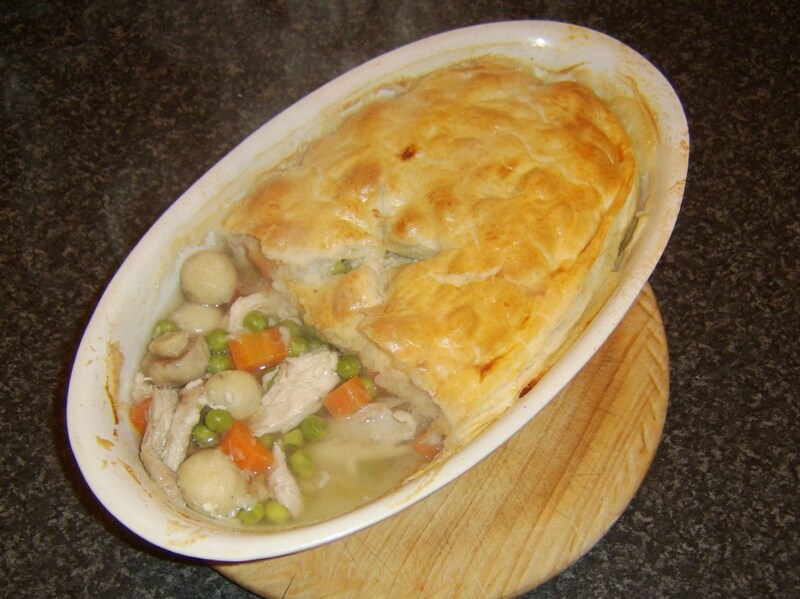 The regional pie and pasty recipes which exist around the UK are virtually countless. If you are visiting the UK and want to try authentic pie productions, you should visit a local butcher's or baker's shop - or even better a local pub for lunch! - rather than resorting to the mass produced, often substandard budget varieties. Not visiting the UK but want to try some of these ideas? You can always make your own at home! What do pies mean to you? Start a deep frying pan of oil or your deep fat fryer preheating while you rub the skins from the potatoes and (optionally) cut them in half. 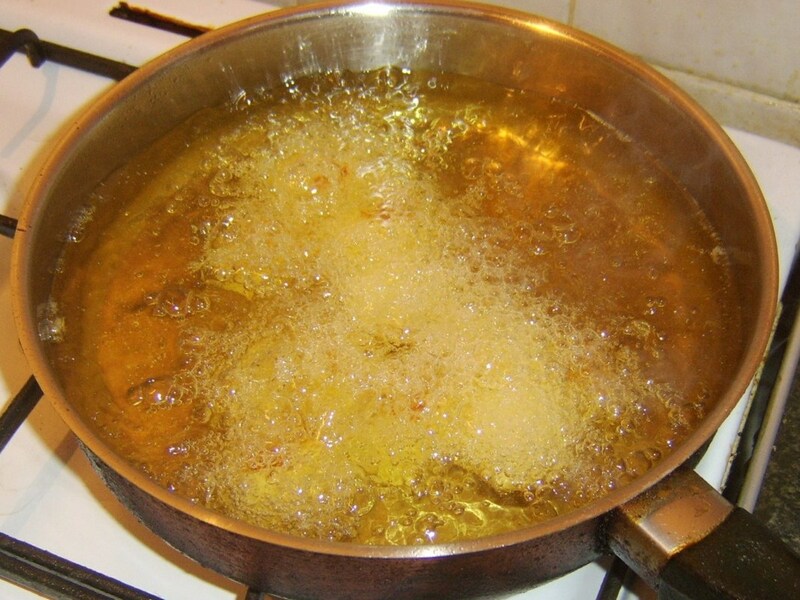 When the oil is fairly hot, add the potatoes and fry for about five or six minutes until crisp and golden, moving them around the pan carefully and occasionally with a metal slotted spoon or deep frying spider. 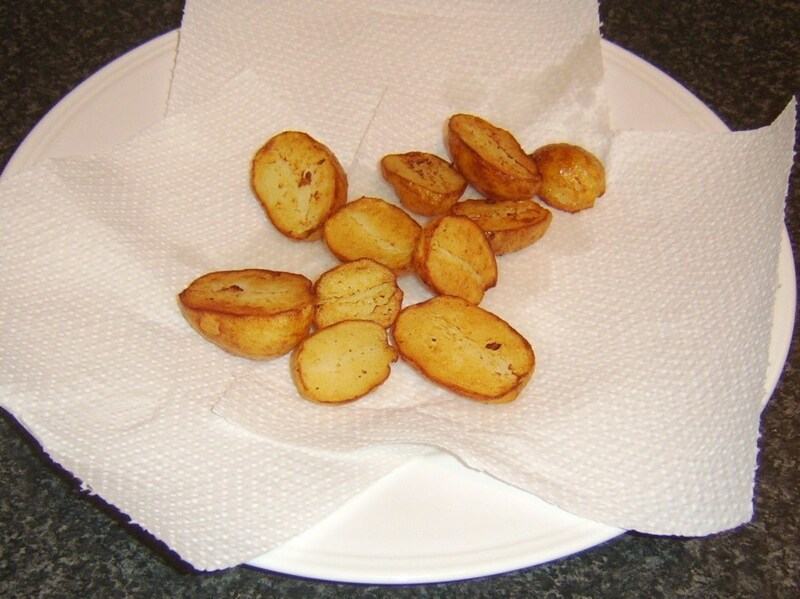 Lift the cooked potatoes to a plate covered with kitchen paper to drain for a couple of minutes. Cabbage leaves of different types will often have a tough central vein in an approximate, narrow triangular shape. This is especially evident in the outer leaves. You may want to cut this out and discard it before you roll the leaves and slice across the way. 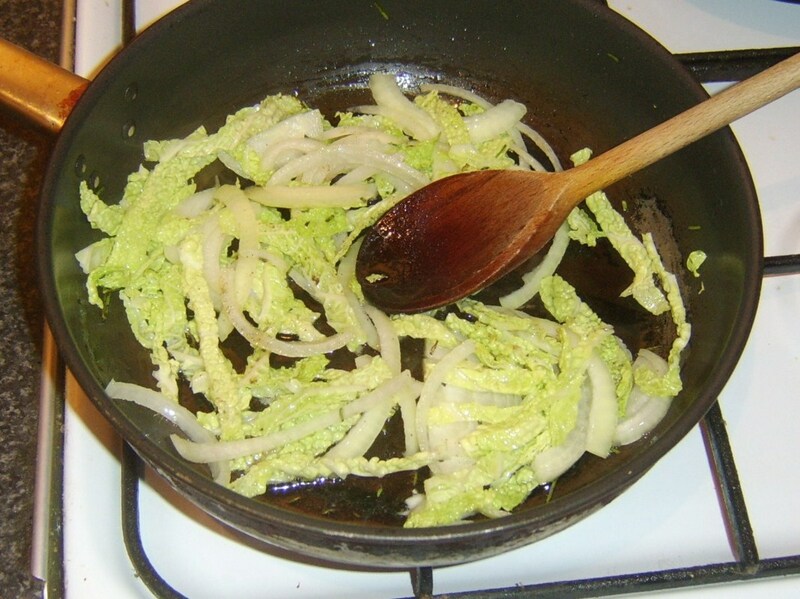 Heat a tablespoon or so of olive oil in a large, non-stick frying pan and add the cabbage, onion and rosemary. Season with salt and pepper. Stir fry for a few minutes until the cabbage and onion are softened. The steak pie can of course be plated up in any way you choose and this is therefore just a suggestion. Cut the pastry in half across the pie. Lift one half up and over on to the other. With a large, slotted spoon, scoop half the pie filling on to the first serving plate. 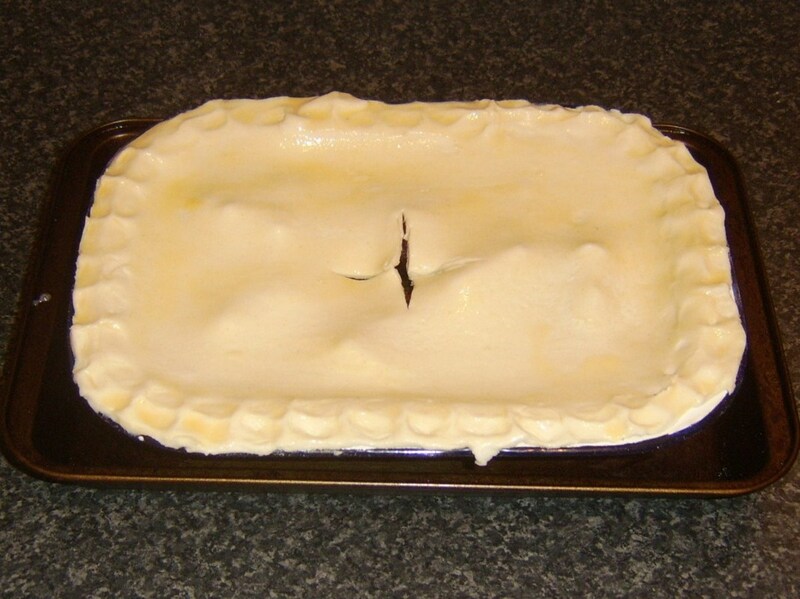 Place the pastry on top of the filling as shown and repeat with the second half of the pie on the second plate. 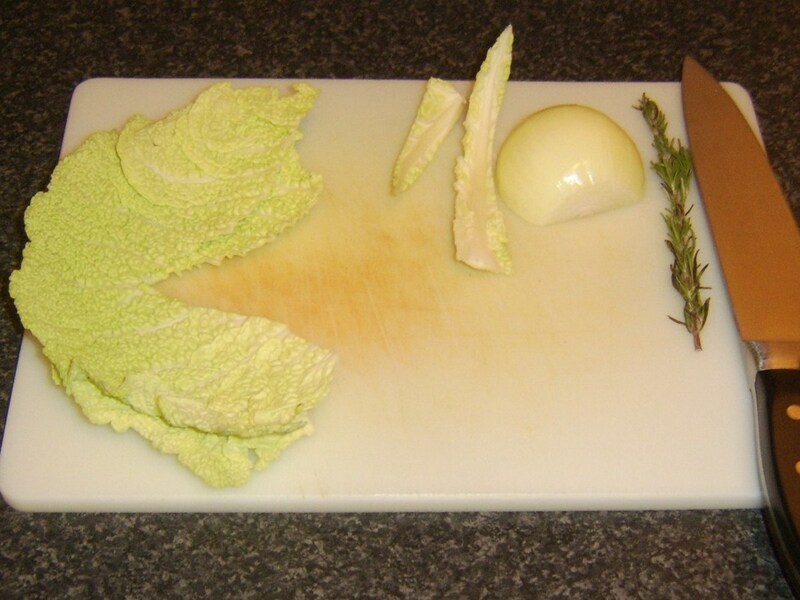 Arrange the potatoes and cabbage alongside to serve, as shown in the photo at the top of the page. Thanks, pstraubie48, Thelma and Jodah. Glad you're a fellow pie enthusiast, Jodah, and hope you enjoy this idea. Congratulations on HOTD Gordon. I am a true meat pie connoisuer, a good pie is one of my favourite foods, and this one looks and sounds delicious as I love beetroot too. Wonderful easy to follow instructions and images too. I can't wait to make it. Congratulations on the HOTD! Well done! Hello, Charito - and thank you. 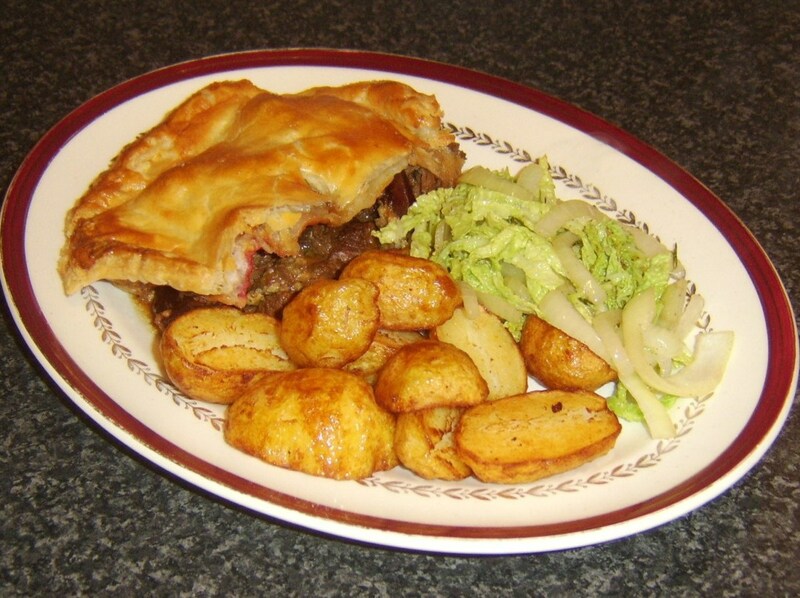 I must say this steak pie and the roasted potatoes sure look yummy. I can almost taste them! Congrats on being HOTD, fellow ex-squid Gordon! Thank you Jill and Kristen. I very much hope you both get to try this out for yourselves. Congrats on HOTD! I would love to try this recipe someday. Sounds delicious! This is right on time Gordon. Lately I have been collecting recipes with beets. And i love a good pot pie! I just pinned this to my casseroles board. Please forgive my inexcusably long time to reply to your comment. I've really been struggling lately with a back injury among other things but that's no excuse. You aren't going to believe this, but I've just got back yesterday afternoon from a week in Scotland. In fact we where in Fort Augustus for 10 days and apart from a little drizzle and a bit cloudy we had a fantastic time. Anyway getting back to your hub. I had a steak pie (wonderful), just as you described with beautiful tasting new (?) potatoes. It came, and looked just like yours in the photo. I had carrots and long beans (french beans?) and a super gravy with it. Thanks for sharing with us Gordon and have a great week. 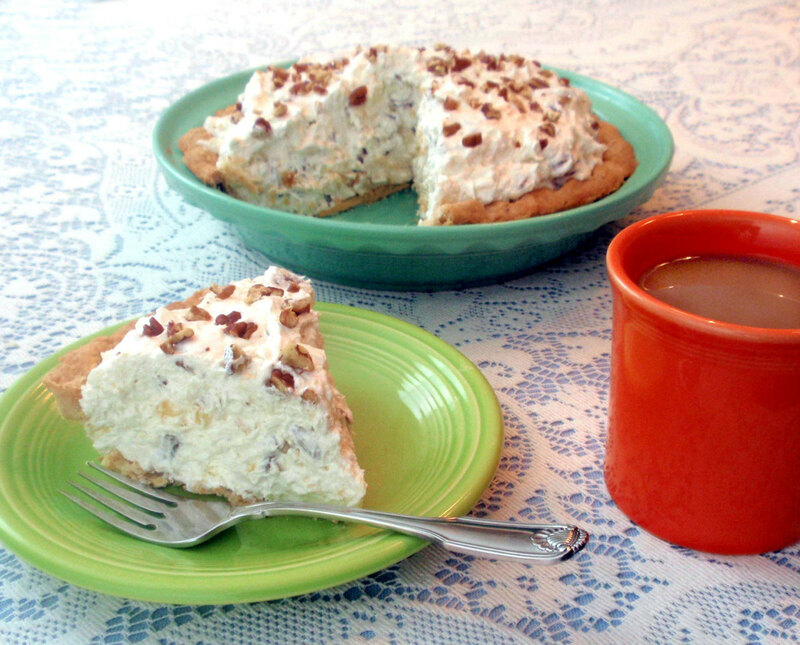 Sorry for tempting you at an inappropraite hour Thelma :) Hope you have a great day too and a chance to try the pie. Thanks for visiting. OMG! I´m getting hungry in the middle of the night. I love pies. I would love to try this. Thanks for sharing the recipe. Have a nice day! Congrats on your win, which was well deserved. This recipe looks awesome. I have never eaten anything quite like it, but I would love to give it a try. I rated in 5 stars as I think it is a delicious looking dish. A good meat pie can't be beat. I shall give this a try. Welcome to the delicious world of beets, Jackie. I hope the coincidence gives you another option to enjoy in the long term. Thanks for visiting. OMGosh ! This recipe I know is awesome and very tasty and I mean to try it very soon. I love meat pies. 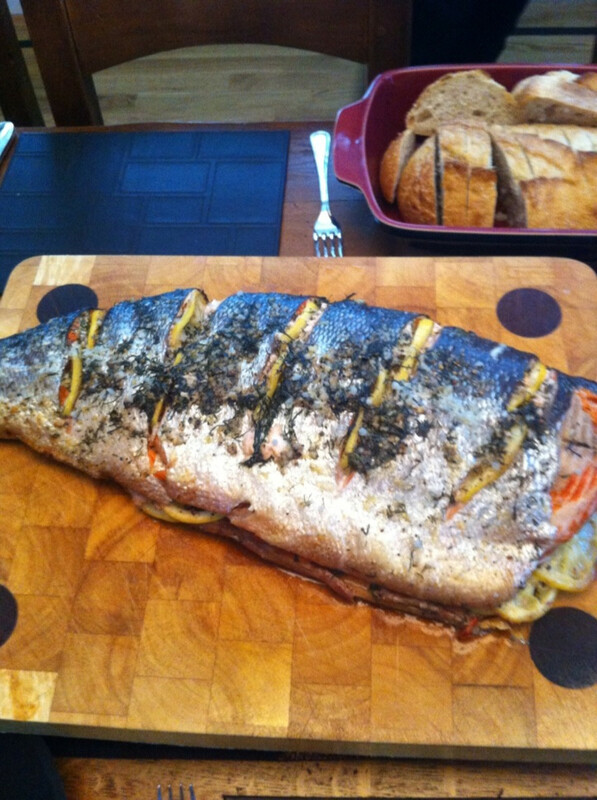 The recipe will also go into my favorites and a link to this hub to my son and daughter. Shared and voted up, bookmarked also. Thank you, Gordon, for this great recipe.